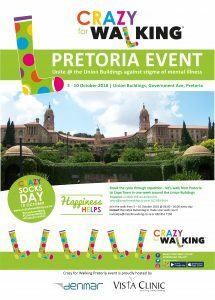 Let’s walk from Pretoria to Cape Town in one week around the Union Buildings to break stigma of mental illness. Join our walks from 06:00 – 18:00 every day. Contact Hannetjie Buitendag to make your walk count hannetjie@crazyforwalking.co.za. Join our Crazy walk in the capital city from 3 – 10 October 2018. 5km walking route around the capital city. The public will be motivated to walk the route more than once to illustrate the fact that you have to repeat certain behavior in order to achieve optimal mental wellness. Here is the crazy part: we attempt to walk 1500 km (distance from Pretoria to Cape Town) in only 7 days. How will we do it? By having at least 3 walkers per day who will walk from for 12 hours (06:00 – 18:00) from 3 – 10 October 2018. Last year only 26 people took part in the epic journey from Pretoria to Cape Town, this year you can walk as well! Private Psychiatric hospital in Pretoria East. Private Psychiatric hospital in Centurion.